my Little homemade products: Say "Aaahhhhhhh"
I have found a new blog (Noodlehead)...yes, another one that I read to inspire me...sometimes it depresses me - these people are so talented, there blogs are so gorgeous and they sew much more than me. I need more time! I really like it, it was my 1st time doing box corners (trickier than I thought). And another chance to use my zipper foot...I am not convinced I am sewing zips in properly - perhaps a lesson by someone with some know-how would be handy! Next time I will sew my label on a bit higher so that it doesn't disappear into the base. 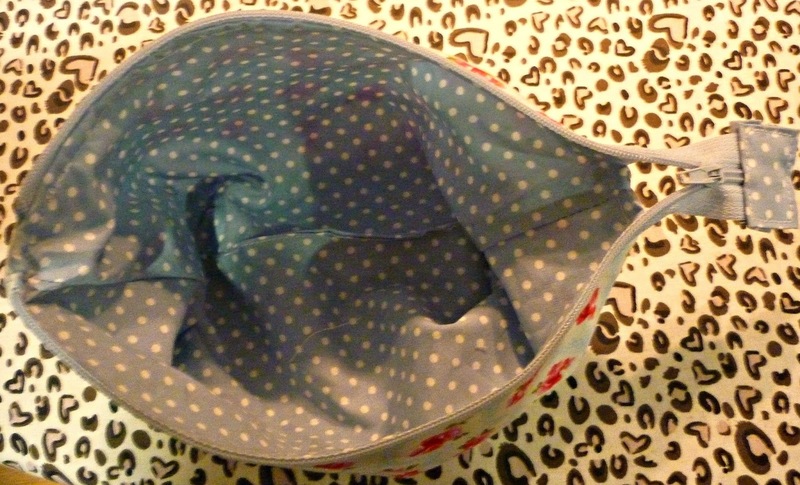 Actually, the next one I am going to make, I am going to make with a lid/flap. 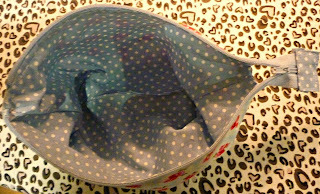 On the inside of the flap I am going to sew a pocket/elastic (haven't decided yet) so that mascara/make-up brushes can be put into the lid. If that doesn't make sense now, it will (hopefully) when I make it and show you the pictures! I bought the fabric from Patchwork Paradise on Facebook - she has a lovely pretty selection of material. I could go a bit crazy and spend all my money on that page.